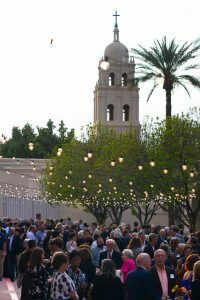 Guests gathered for the Ninth Annual KBI Dinner at the Brophy College Preparatory campus in Phoenix. Photo by Jake Kelly. 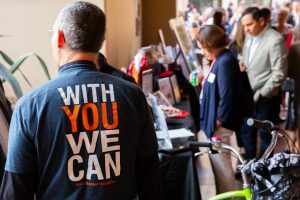 Friends and donors gathered in Phoenix to celebrate the KBI’s endeavors of the past year, and to support our ongoing mission of humane, just, and workable migration between the U.S. and Mexico. 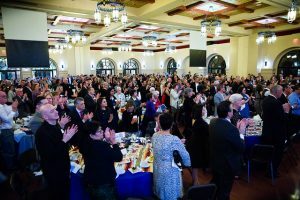 This year, the dinner raised over a quarter of a million dollars for the KBI’s continuing work and a new migrant center with expanded space and resources. 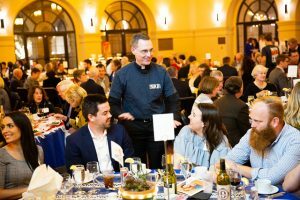 As our largest fundraiser of the year, the Annual KBI Dinner is always a powerful expression of support for the KBI, and a form of accompaniment for the migrants we serve. At this year’s dinner, held on Saturday, March 9, at Brophy College Preparatory in Phoenix, 440 KBI supporters came together in strength and solidarity at a time of ever-increasing vulnerability for migrants and asylum seekers and, as the evening progressed from reception and dinner to a live auction and presentations, raised close to $260,000 for the KBI. From the moment guests arrived, the feeling of warmth, conviviality, and purpose was palpable. It was a chance to reconnect with old KBI friends and meet new ones, and to mingle with KBI staff and board members. 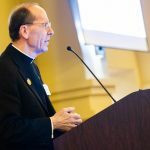 Executive Director Father Sean Carroll, S.J. and Board President Steve Haydukovich welcomed everyone at the registration table, joined by this year’s Pope Francis Award honorees, the Missionary Sisters of the Eucharist. 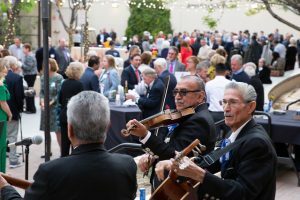 As dusk settled and overhead string lights illuminated the courtyard, the crowd enjoyed refreshments to the foot-tapping music of the Happy Mariachi Trio. Brophy student volunteers, clad in t-shirts proclaiming the dinner’s theme—“With You We Can”—passed appetizers before heading into the Great Hall, followed by the guests, to prepare for dinner service which commenced with a blessing from Bishop Thomas J. Olmsted of the Diocese of Phoenix. Bishop Olmsted offered an opening blessing before dinner. Decorated simply but colorfully with bright tissue paper and striped serapes, the hall was filled with dozens of round tables, each with a potted succulent centerpiece, the terracotta coated with blackboard paint and chalked with words of inspiration—“faith,” “patience,” “love,” “hope.” In the spirit of the fundraiser, all the centerpieces were sold, so the Dinner Committee made extra pots for the Missionary Sisters of the Eucharist in gratitude and as a memento of the evening. After updating everyone on the current challenges at the border, Father Sean turned the podium over to master of ceremonies Rick DeBruhl and auctioneer Bob Hubbard. Sister Cecilia kicked off the bidding with a ride around the hall on a Ladies Electra 7-Speed Cruiser, the first auction item. Other items included a flight to Sedona for the day; retablos by Karen Bennett; a painting by Hilario Gutierrez; a Diamondbacks gift basket; an interactive cooking class; a long-weekend Show Low getaway; diamond earrings; and the always popular home-cooked meal from KBI chefs, Father Sean and Father Pete Neeley, S.J. Inspired by the lively bidding, local jeweler Al Molina spontaneously offered a $5,000 gift certificate for his store. 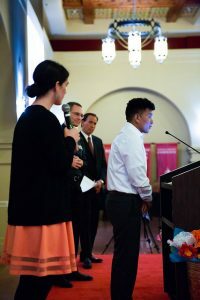 For many, the most touching part of the evening was hearing Fredys Sevilla speak about his experience as an asylum seeker at the KBI and watching Pete Burr’s stirring video, 11,000 Stories: Challenge, Hope, and Solidarity at the U.S.–Mexico Border, about the KBI’s hands-on work (links below). 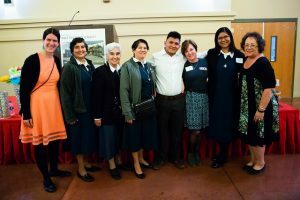 Fredys, who now lives in Virginia with his sister, his brother, and his brother’s family, spoke about his fears and despair in fleeing organized crime recruitment in his home country of Honduras and the hope engendered when he encountered other migrants and KBI staff and volunteers at the comedor. One of the first people served by the KBI/Florence Project Legal Fellow, Fredys leaned on his faith and the legal, emotional, and pastoral support from the KBI throughout the asylum process. Speaking mostly in Spanish, with Joanna again providing interpretation, he told those gathered, “You saved my life.” His poignant testimony brought smiles, tears, and everyone to their feet. The screening of 11,000 Stories rounded out the event with images of those we serve—more and more of whom are women, children, and families—and descriptions of the atmosphere of support, encounter, and accompaniment fostered at the KBI. With the new migrant center, already under construction, the KBI will be able to provide more services to greater numbers of people and meet the growing need at the border. With the encouragement of Rick DeBruhl and Bob Hubbard, attendees committed payments and pledges for the new building totaling $100,000 of the overall funds raised. Finally, to close the evening, Father George V. Wanser, S.J. of St. Francis Xavier Parish in Phoenix offered a benediction. As the KBI has grown, so too has this signature event. Co-chairs Lisa Grant and Ann Rathwell and the entire Dinner Committee did an extraordinary job, providing hundreds of guests with food for body and soul as well as a compelling opportunity to stand with the KBI and the migrants we serve. 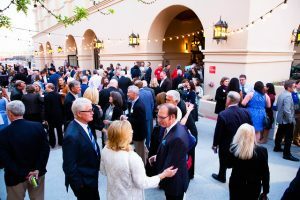 That first dinner nine years ago was a much smaller affair of 40 dedicated donors; today it reflects a base of support that extends well beyond the Brophy campus or a single night, and makes the KBI’s work possible all year long. With you, we truly can. If you’d like to make a donation to support KBI programs and the new migrant center, you can do that here: https://www.kinoborderinitiative.org/give/. Thank you! Many thanks to all who donated to the Ninth Annual Kino Border Initiative Dinner and who made this successful fundraiser possible, specifically: co-chairs Lisa Grant and Ann Rathwell, and the entire Dinner Committee of Pete Burr, Marina Gomez del Campo, Lucy Howell, Bob Hubbard, Mary Johnson, Maddie Murphy-Larkin, Mary Novotny, Bob Staab, and Patti Thoeny with KBI staff Father Sean Carroll, S.J., and Deacon Javier Fierro. We also thank Brophy College Preparatory for hosting the evening, and Facilities Coordinator Sherri Stephens and her maintenance team; the Brophy College Prep students who provided reception and dinner service, coordinated by Brophy moderators Steve Smith and José Leyba; Sierra Bonita Fine Catering for the delicious appetizers and meal; Mark Carretto of Caretto Vineyards and Rene Mayer Martínez and family for providing wine; and Nackard Bottling and Legacy Beverages for donating beer, soft drinks, and bottled water. Thank you to artist Pamela Hoffmeister for her migrant portrait for the Pope Francis Award; artist Karen Bennett of Palette of Possibilities for the retablos Our Lady of St. John of the Lakes and St. Joseph; Hilario Gutierrez for his painting, Close Enough to See; the Arizona Diamondbacks for a generous gift basket with a voucher for four dugout tickets; and other donors to the live auction—Steve and Darci Haydukovich; Bob Hubbard; Sierra Bonita Catering; Sun Cyclery; Rodrigo and Diana Vela; Robert C. Wesley Jewelers; Al Molina; and our capable Jesuit chefs Father Sean Carroll, S.J. and Father Pete Neeley, S.J. Thanks to the volunteers who facilitated auction spotting and check-out, and to parents from Brophy College Prep and St. Francis Xavier Elementary and Xavier College Prep students who worked on the Dinner set-up. Thanks also to St. Patrick Catholic Community for underwriting printing services; emcee Rick DeBruhl and auctioneer Bob Hubbard; the Happy Mariachi Trio for their musical accompaniment; Bishop Thomas J. Olmsted of the Diocese of Phoenix for his opening blessing and Father George V. Wanser, S.J. of St. Francis Xavier Parish in Phoenix for his closing benediction; Joanna Williams for serving as the Spanish–English interpreter; registration table helpers Gail Caretto, L’Jean Fairbourn, Jennie Howell, Katy Howell, Lucy Howell, Sandy LaBonte, Donna Nelson, Mary Novotny, Elaine O’Toole, Cristobela Parra, and Sharon Ryan; bartenders organized by Bob Staab—Steve Jenkins, Steve Howell, Rich DiCarlo, John Howell, Steve Howell, Dave Grant, Pete Rathwell and Mike Williams; Brophy Fine Arts Department Chair Pete Burr for the moving video about the KBI’s work, 11,000 Stories: Challenge, Hope, and Solidarity at the U.S.–Mexico Border, and the PowerPoint presentation; Brophy teacher Jake Kelly for documenting the evening through photos; and KBI staff and board members for their invaluable assistance. ¡Muchísimas gracias a todos! 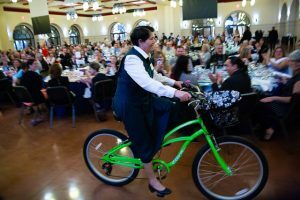 Sister Cecilia took the first live auction item—a Ladies Electra Cruiser—for a spin to start off the bidding. 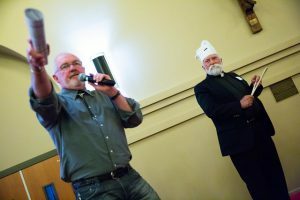 Bob Hubbard (here, with Father Pete) kept the bidding lively for a popular auction item every year—a home dinner prepared by Father Pete and Father Sean. 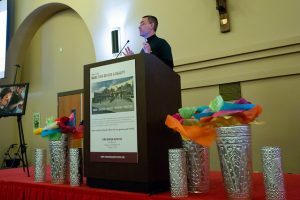 Father Sean addressed the gathering, offering remarks about the past year for the KBI and the new migrant center under construction. Fredys Sevilla offered a moving testimony in Spanish about his journey and successful asylum application while Joanna Williams provided English translation and Father Sean and Rick DeBruhl listen. The guests responded to Fredys’ story with a standing ovation. Father Sean circulated through the Great Hall to catch up with dinner guests. The Happy Mariachi Trio provided music for the reception. Before dinner, guests had a chance to mingle with old friends and meet new ones. Father Sean in a t-shirt announcing the dinner’s theme—With You We Can—also worn by the Brophy students who provided reception and dinner service. 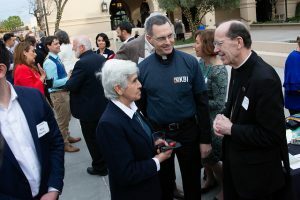 At the reception, Sister Engracia and Father Sean chatted with Bishop Olmsted. This year’s Pope Francis Award honored the Missionary Sisters of the Eucharist who run the KBI’s comedor and shelter. 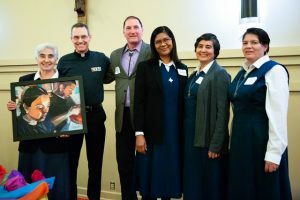 Pictured (l to r): Sister Engracia (holding Pamela Hoffmeister’s migrant portrait), Father Sean, KBI Board Chair Steve Haydukovich, Sister Maribel, Sister Alicia, and Sister Cecilia. Post-dinner group portrait (l to r): Joanna Williams, Director of Education and Advocacy; Sister Alicia Guevara Pérez, M.E., Casa Nazareth (women’s shelter) Coordinator; Sister María Engracia Robles Robles, M.E., Education Coordinator–Mexico; Sister Cecilia López Arias, M.E., CAMDEP (comedor) Coordinator; Fredys Sevilla; Lisa Grant, Board Member and Dinner Committee Co-Chair; Sister Maribel Lara Hernández, M.E., Volunteer Coordinator; and Sally Ortega-Bravo from Brophy’s Loyola Academy. KBI continues to give inspiration and hope as the struggle to care for and love God’s precious migrant peoples continues. The expansion facility is much needed and I promise to commit time in prayer for it’s construction and operation.